The first interview aired last August. The second will air this weekend, beginning on January 21. You can listen to the shows here, or keep reading for info on how to hear it on the radio or download the podcast. Rick Steves’ radio show is broadcast on more than 400 radio stations throughout North America. Each station chooses when to air it, so the days and times it will be on will vary from location to location. Many stations stream their broadcast live on the Internet too, so throughout the weekend, there will be lots of times to listen, no matter where in the world you are. You just need to find a station that’s playing the episode when you want to listen. Check out the full list of stations and times for Rick Steves’ radio show. 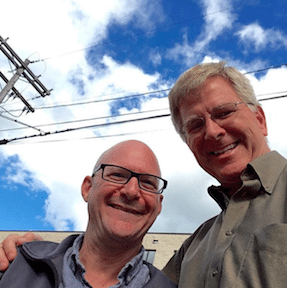 Me and Rick Steves – in his über-exotic parking lot in Edmonds, Washington. The program is also available on Rick Steves’ podcast and his Audio Europe Travel App. And hey, if listening to me talk about Vietnam on the radio isn’t enough for you, then come for a visit! I’ve just announced the details of my new Vietnam travel writing tour! Join me as we explore Ho Chi Minh City (Saigon), the Mekong Delta, Hanoi, and the Halong Bay / Bai Tu Long Bay areas. I’ll be teaching travel journaling classes as we go. to help you write scintillating tales of your travels. I’ll be announcing a new date very soon for a tour beginning in November, 2017. I’d love to see you here!